Warner Home Video has struggled quite a bit in the past year or so with its home releases. The 2013 releases of Tiny Toon Adventures Volume 4, Taz-Mania: Season 2 Part 1, and Hats Off To Dr. Seuss were all troubled with their own problems. 2014 hasn’t exactly been off to much of a better start thanks to the release of The Flintstone Kids: Rockin’ in Bedrock. That release presented only the main Flintstone Kids shorts minus the companion Captain Caveman and Son and Dino shorts. That alone took off major points from that set. But now WHV has finally started to pick up the ball and get things back on the right track thanks to the brand new release of This is America, Charlie Brown. This brand new double-disc has officially made its own spot on this critic’s list of the year’s best new DVDs and Blu-rays for families and children. The primary reason for that the features included in this set are both entertaining and educational. Another reason for the set’s enjoyment is the use of both hand drawn animation and historical photos to help illustrate each “lesson.” The last factor to examine in what makes This is America, Charlie Brown a success is its packaging. Each of the noted factors by themselves, play important roles in the success of the set. Together, they make this brand new release one of the year’s best new box sets for families and children. The first and most important factor in the success of This is America, Charlie Brown is the combination of both entertainment and education. The eight features spread across the set’s two discs educate viewers in such fashion that it doesn’t even feel like viewers are being taught. Thanks to the legacy of the Peanuts gang, it feels more like viewers are going on a fun field trip through America’s history than just learning about history from another documentary. There are even some fun little pop culture references that parents will appreciate along the way. One of those references is to the command module of the Apollo 10 being named Charlie Brown. Lucy comments on this saying that she doesn’t know where such a name could have come from. The kids also see their own comic strip hanging in the Smithsonian Museum of Art. The little reference there is just as funny. On a more subtle level, audiences that know anything about animation history will appreciate Frank Welker (The Real Ghostbusters, Curious George, Garfield & Friends) as the voice of a number of characters here including Wilbur Wright in “The Wright Brothers at Kitty Hawk.” Gregg Berger (Garfield & Friends, Aahhh!!! Real Monsters, G.I. Joe) joins Welker as the voice of Wilbur’s brother Orville. This isn’t the only feature to which Berger and Welker offer their talents, either. Lou Rawls joins them in “The Music and Heroes of America” and makes the journey all the more enjoyable even as being an educational journey. It serves as one more example of how the combination of education and entertainment is such an important factor in the success of this set. It isn’t the only important factor to the set, either. The combination of entertainment and education in the features that make up This Is America, Charlie Brown is a solid foundation for the mini-series in whole. Just as important to the set’s success is the use of both hand drawn animation and historical photos to help illustrate and advance each story. Kids will be entertained by the hand drawn animation. And parents that grew up in the days of true animation will appreciate the original animation style of this Peanuts presentation. Those behind the mini-series balanced the animated segments with just enough historical photos to help drive home the stories in each feature. They even included some vintage video to help advance each “lesson,” too. And that video is just as balanced. The resultant effect is a presentation in each feature that will keep viewers of any age fully engaged from start to finish. It’s one more aspect of the whole mini-series that maintains the set’s value. The visual presentation of the mini-series’ features and the ability of the features to entertain and educate without being too outright about their educational purpose are key to the success of This Is America, Charlie Brown. There is still one more factor to examine in the set in considering what makes it worth the purchase and the watch. That factor is the set’s overall packaging. Both of the discs in the set are placed on their own spindle inside the case. On one level, this protects the discs from scratching one another, thus increasing their life span. On another level, it minimizes the size of the box used to contain the discs. The bigger picture of this is that it conserves space on any viewer’s DVD rack. So not only is the mini-series in whole educational and entertaining, its case is ergonomic. Sure, there’s little else to the set whether extrinsic or even intrinsic. It’s a bare bones presentation. But these factors together make This Is America, Charlie Brown a much needed win for Warner Home Video and for fans that have waited so many years for this mini-series to get a proper release. This Is America, Charlie Brown is available now in stores and online. 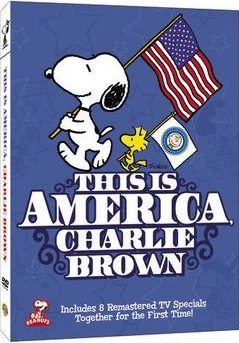 It can be ordered direct online from the WB Shop at http://www.wbshop.com/product/this+is+america%2C+charlie+brown-+the+complete+series+dvd+1000411223.do. To keep up with the latest sports and entertainment reviews and news, go online to http://www.facebook.com/philspicks and “Like” it. Fans can always keep up with the latest sports and entertainment reviews and news in the Phil’s Picks blog at https://philspicks.wordpress.com.